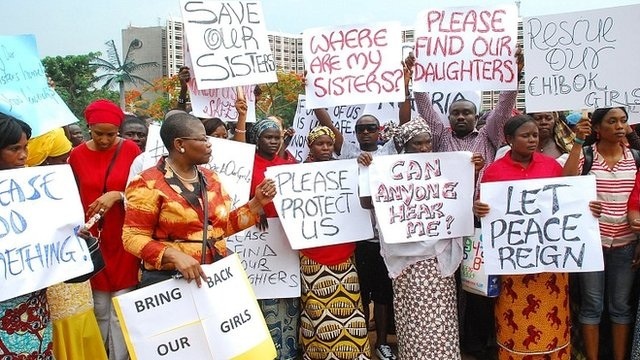 Nigerians want their 234 daughters back from the claws of Boko Haram. There have been protests in Abuja, Lagos, Ibadan and Kaduna by women and workers representatives showing a nation in distress. A reminder of acts in 'Oedipus' a popular drama, where the people went before the king with supplications for a solution to evil that beset the land. But unlike the Oedipus's mystery, Boko Haram is the nemesis here. The discussion now is how to get the girls back without causing their death. The military says it is working and has promised to get the girls without causing their death. Against military's approach, some Nigerians are calling for total declaration of war and destruction of everything Boko-Haram. But how will the country do this with 234 girls with Boko-Haram? Answering this question has made President Gooodluck Jonathan besieged like Hyrothgar in 'Beowulf', when a monster called Grendel and his mother descend on the land for the beauty of Heorot and songs praising God in the hall. Boko-haram, like Grendel, says it hates western education. But Hyrothgar got help from a friendly leader against Grendel and its mother, unlike Nigeria whose friends are watching Boko-Haram decimating the country. When the Islamists descended on Mali, France went and drove them away. Where are Nigeria's friends? Majority of Nigerians love education, especially western education and lifestyle. It is what Boko-Haram don't want and has vowed to continue its attack on the country until the government allows introduction of Sharia into the country's legal system. The Nigeria's military has proved incapable of ending the Boko-Haram's insurgency. There is fear that the monsters may extend their butchering beyond the north east to other parts of the country as shown with a recent on Abuja with a loss of over 75 people at a motor park. Nigerians can hardly trust their own military to quell continued attack from Boko-Haram. Like many African nations besieged by political and economic problems, they look up to the United States of America for help and succor. Many people have asked about why Britain is silent in helping Nigeria. There are many more Nigerians living in Britain than the US. Britain colonized Nigeria just like France did Mali. France has been manifest in helping Its former African colonies as shown in Mali, Central African Republic etc. Moreover, this is about humanity and helping it against marauding monsters. When Hygelac offered help to Hyrothgar in Beowulf, it was based on past relationship between the Danes and Swedish nation. Hyrothgar did not personally seek Hygelac's help. Hygelac's arrival through the sea with his men surprised the Danes and was held to stay at the port for Hyrothgar to be informed of his mission to help the Danes. Today, Nigeria needs help to combat and stop Boko-Haram. The Nigeria's military needs buoying to set the Sambisa forest ablaze and for the world to know places Boko-Haram monsters use as havens against Nigeria. Some reports have mentioned Cameroon, Chad and Niger. President Jonathan must be ready to declare war against Boko-Haram and any country within its borders that harbor Boko-Haram rest assured that the world will be on his side, because anywhere I go as a Nigerian people ask about what the hell Boko-Haram going to do with innocent girls they have seized.